VISIONS OF THE NORTH: Was evidence of the Franklin ship found in 1965? With all the celebration which has quite rightly attended the extraordinary discovery of one of Sir John Franklin's ships by the Victoria Strait expedition, those of us still stuck in our armchairs have, quite naturally, returned to our reading and research with renewed spirits. And it was while digging about in this manner that my fellow Franklin blogger Andrés Paredes Salvador stumbled upon an old, torn clipping at the website of the Derbyshire Record Office, home to a large collection of Franklin materials. 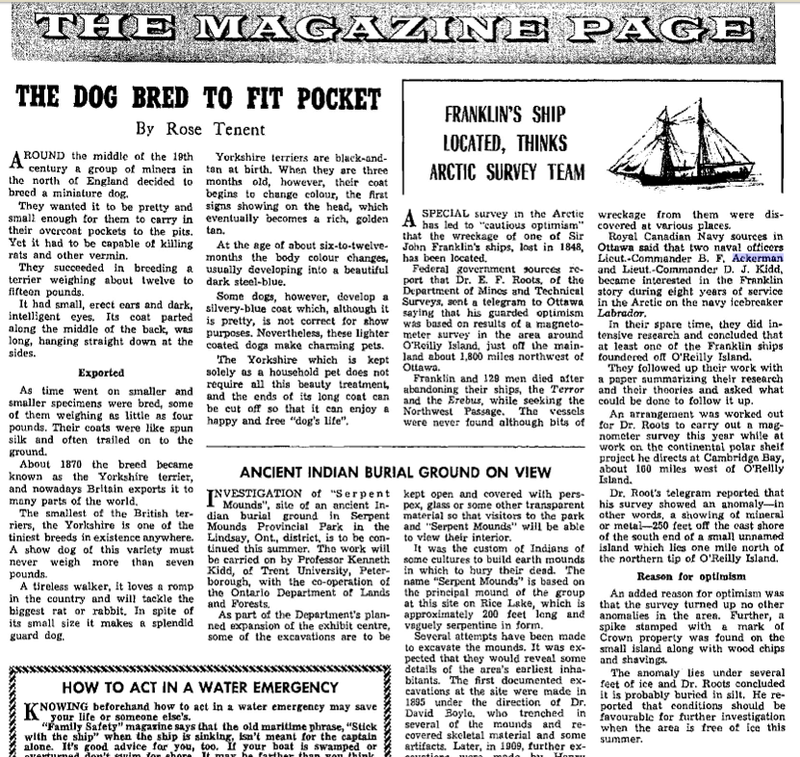 The clipping, from April 14th 1965, was headlined "ECHO FROM THE DEEP: Wreck May End Riddle of Arctic Adventure." It seemed, from the remaining bit of the article, that two Canadian naval officers, D.J. Kidd and B.F. Ackerman thought they had found the site of one of Franklin's ships. Was such a thing even distantly possible? Why had no one heard of Kidd or Ackerman? What was the result of their claim? It took me some time to find any details of their claim, and when I did, it was in an unusual place -- a digitized copy of The War Cry, the official magazine of the Salvation Army. Astonishingly, these men had done their own research, and had -- as have Woodman and other modern searchers -- identified the area near O'Reilly Island as the likely site of one wreck. They then persuaded Dr. E.F. Roots of the Polar Shelf staff in Cambridge Bay that it was worth trying a magnetometer search, looking, as would Woodman nearly 30 years later, for the magnetic signature of the ship's ex-railway engine. They identified a target, described as "250 feet off the east shore of the south end of a small unnamed island which lies one mile north of the northern tip of O'Reilly Island," and seemed to have a high level of confidence that this was the ship they sought. I know from talking with Dave Woodman over the years how tough it is to use a magnetometer survey in this way -- he in his own searches identified numerous targets, discovering, when he examined them with side-scan sonar, that they were, alas, just natural features. He mentions the 1965 search in his Unravelling the Franklin Mystery: Inuit Evidence, on page 267. Still, with the claimed site so close to this year's find, one wonders: could these two forgotten men have actually found the site of the ship or some part of it 49 years ago? They also reported finding a spike marked with the "broad arrow" near the site -- which apparently led to the "nameless" island being named "Nail Island" -- along with wood chips and shavings, which could suggest that these were from Inuit re-purposing of wood from the ships. Dr. Roots himself came to believe that their finding was just a natural feature, and the initial excitement soon died down. They in actual fact were following up an earlier area magnetometer survey by Canadian geologists that had identified a large discrete anomaly in the area (without any knowledge of Franklin history). The large anomaly, I believe, was one of those we relocated in our 2002 magnetometer survey and labelled by Brad Nelson (our expert) as "enormous." It was, in his opinion, about 1000 times too powerful to have been caused by a Franklin ship (hence discoverable using 1960s technology).The water depth was, if I remember, much too shallow to allow for the wreck (the hull would have been visible - so not in accord with the Inuit testimony) and was very close to O'Reilly Island (so not germane to where the wreck was actually found - further north). Thank you very much Russell for mention me! There wasn´t really need for it. I just found that piece of article and decided to share it. I had on some corner of my mind the idea that some sort of magnetic anomaly had been detected somewhere in the proximity of King WIlliam Island, but surely this correspond with the Woodman´s research. "The only other shipwreck incident reported in the area is a barge that sank in 1926 to the west of O’Reilly Island (Woodman 2003: 8). Although probably an old sailing vessel, identifying the remains of this barge in contrast to a bomb vessel should be straightforward with visual access. It is generally thought that because Terror and Erebus were ships of the same type they were, therefore, practically identical, especially after their refits for polar service. This would make identification between these two vessels difficult." It is also curious to note how it is predicted in this paragraph how difficult would be the identification of the vessels in the case of being found. Hi Andrés, thanks for your comments, and these links. I've just heard back from Dave Woodman, who as I'd suspected knew all about the 1965 anomaly -- apparently it was much too strong/large to have been a ship's engine, large enough to show up on 1965-era equipment. I imagine it would be too big to be the barge as well. Still, exciting stuff; I always love stumbling upon something new about the history of Franklin searches! I wonder if Kidd was related to the geologist referred to as "Dr. Cap Kidd" who surveyed the Nueltin Lake area in the 1930s.